I recently read an article on Lifehacker.com (one of my favorite websites) about how to use Chrome and Chromium Side by Side. Doing this will allow you to have multiple users or multiple accounts with the two almost identical allowing you to sync information from one computer to another. First, set up a generic class Google account. This could be a regular Gmail account or a Google Apps account, it really doesn’t matter. You just need an account to set up the sync. Now comes the fun part. When you present your lesson to your students and need to share a link, you could give them a shortened URL or have the log in to a social bookmarking site like Diigo, but instead all you will have to do is create a bookmark on your browser. The bookmark will sync with all of the other computers in the lab tied to that class account. You could even do this on the fly in the middle of class (the students might need to hide and then show the bookmarks bar to refresh it). Even better, you could have one student share a link quickly with the rest of the class. If you wanted to take it to the next level, set up bookmark folders for different units/subjects, classes, or even students. This is social bookmarking without the extra log in for our students. 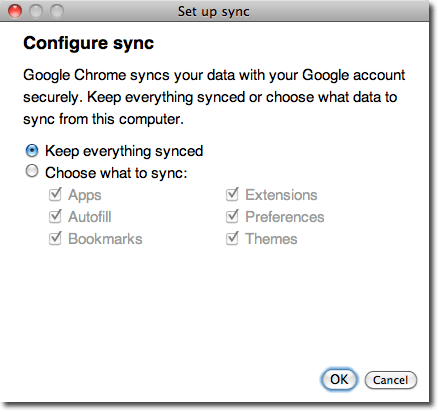 Some final clarification: You are only using the generic class account to set up the sync in the Chrome Browser settings. You and your students are not using this to log in on a Google Apps account. That is part of the beauty of this setup. You get to sync all the cool stuff with Chrome but you and your students will still be able to get to your individual accounts with your own mail, docs, calendar, etc. Who said Google Bookmarks was dead? Now get out there and sync some bookmarks. In my last post “How to become a Google Apps EDU Certified Trainer” I mentioned using Camtasia, a TechSmith product. It made me reflect on their outstanding products and how I use them in my different roles in Education. As an Educator, I find myself consistently using software from TechSmith. I have used Camtasia for the last two years at school and Jing for at least that long. In my experience, their software is simple to use with outstanding results. As a teacher and Technology Coordinator for the Le Grand High School District, I use Jing to quickly take screen-shots and screen-captures to help my students and staff. If I need to easily show someone where the submit button is on the screen or how to reserve a room using Google Calendar, Jing is the software I open. With a few clicks I can quickly take a screen-shot or a screen-capture, save and upload it, and have a URL to email or post for students or teachers to view. I find myself also using Jing more and more for twitter to help answer questions or to ask my own questions. As a Google Certified Teacher and a Google Certified Trainer I have had the opportunity to be a Lead Learner (presenter) for professional development sessions for educators from around the world. I have found Snagit to have that professional polish for taking screen-shots to add to my presentations. Snagit is as simple to use as Jing but with some great added features, like drop shadows and transparency to name a couple. As a blogger and an online teacher, I find Camtasia Studio to be a wonderful tool. Camtasia allows me to make great how-to videos and simply save them locally or send them to Youtube to be published to the world or my class. For on-line courses it’s a must have. I can show and explain the process the students need to perform simply, with no confusion. As a blogger some of my most viewed posts are ones with screen-captures demonstrating cool applications or software. Again, TechSmith makes things easy in Camtasia just like in Jing and Snagit, but still gives you the added features to take your screen-capture productions to the next level. TechSmith has an Education Community and an Education Blog for more information on using their products in Education. I would love to hear how others are using these products or similar ones in their classrooms. Please use the comments below and be sure to leave a link to your How-to’s. What would Google do if they ran a school? I have been reading a book written by Jeff Jarvis, “What Would Google Do?“” The book is very good and it has inspired me to write this blog post and ask the question, what would Google do if it ran a school. I hope Mr. Jarvis is ok with me expanding on his thoughts and topic of his book. The first idea that I think Google would implement in a school would of course be the twenty percent rule. Just like how Google encourages their employees to work on a project of their own design during 20% of their work schedule. Students would be allowed to use 20% of the week, one day, to work a product of their choosing. Now of course they would need to have the project based on the topic they are studying, but we would be encouraging creativity, self instruction, and self work habits, not to mention teaching the idea of being a life-long learner. The students would not be the only with 20% of their time available. Teachers would also be encouraged to be creative during this time. Imagine the outcome and possibilities that could come out of this time. The next thing that would be encouraged on campus would be networks. Now education has encouraged networking before. This not a new thing and teachers have been collaborating to improve student learning. This is networking to the next level. Networks between not just teachers but students, parents, staff, and administration. Remember it is not just the teachers job to teach a student, but the whole village. Google Apps would be the tool of choice in the case of this network. A way to build collaboration on a grand scale, not just on the school site, but in the community as well. I can only imagine what the next Wave will bring (pun intended). Google Wave will allow even more interactivity and hopefully make it easier for this network to excel. It was introduced as the future of email but it is also the future of collaborative document building and networking. Distributed learning would also be key to a Google run school. Google does not wait for its costumers to come to them; they go to their costumers. They have their information everywhere and allow others to put the information on their own websites. Google also allows individuals to use their services to make their websites better. Just think of the possibilities when schools and teachers start sending the information to the students. Students would not have to go to a teacher’s website; the information the students need to complete an assignment would come to them. This could be many forms: subscriptions to RSS feeds, a YouTube video feed, or even as simple as emails. The students would have it there where they need it, in front of them. Great companies do a great job of listening to their costumers. They find out what their costumers need and want out of products. They monitor the web for information about their products, good or bad. They take the criticism and accolades of the product and monitor and adjust. What if we took this practice into education. Google would implement this process. Allow students, parents, teachers and administrators to give their opinion on the process. This could be very scary to the average teacher or administrator. What if we get crushed with criticism or negative feedback? Then Google would monitor and adjust. Of course a company could not fix every tiny glitch, but they could try, and a school should too. Of course we should instruct our students on how to be responsible citizens and criticize in a constructive manner and not just rant. This is simply building a community that can only build a stronger school. I know some of these things are happening already by early adopters, forward thinking, and tech savy educators. Some or all of these things could help change education for the positve. It cannot just be done by one or two individuals at a school. The entire school or district needs to make these changes. Please tell me what you think in the comments. I would like to hear the positives and negatives. I am only half way through the book so I hope to have a second post with more ideas and thoughts later. My Blog as a word cloud courtesy of Wordle. My Blog as a word cloud courtesy of Wordle. I am glad to see that FFA and Students are some of the biggest words. Give Wordle a try; I think you will have fun with it. This could be a fun add-on for students that have a long assignment to complete. You ever have one of those days? We all know what comes next, a whine about a bad day we had. In this case, just the opposite. I had one of those days that keeps me excited about being a teacher, working with students, and being involved as an advisor for the FFA. The day started out fairly normal for an FFA activity day, on the road by 5:30am. Then I arrived at Modesto by 6:30 to meet some students that needed to set up their posters before anyone else; they wanted to get the best spots. They were running for one of six spots on the Central Region FFA Officer Team. The posters were to help them campaign during the elections to seek out votes from the 120 or so delegates representing roughly 60 FFA chapters in the northern Central Valley of California. There would be a Regional Meeting, Regional Leadership Contest Finals, Regional Awards, and Regional Officer elections all held on this day. The three Seniors would be attending as voting delegates for their chapters and also as representatives of the section to hand out awards and help put on regional contests. The three Juniors had all been slated on the ballot for regional office. The first supprise – my sectional officers selected me as the Outstanding Agricultural Advisor in the Merced/Mariposa Section. What a great honor it is to be selected and recognized by students for the job you are doing. I am always overwhelmed at how thoughtful and insightful FFA members are, especially ones at this level. The next surprise happened at the end of the day’s events. All the speeches had been given and ballots had been tallied. My three Juniors from my sectional officer team had all been selected to be part of the Central Region Officer team. Out of six sections there were three sections represented on the officer team. Two officers were from the Sacramento Section, one from the Stanislaus/Toulumne Section, and my three Sectional Officers from the Merced/Mariposa Section. I was very happy for them and know they will do a great job representing us. This sectional team has been outstanding; not only are half of them moving to the next level but the other half of the group, the seniors, will all be running for State FFA Office in April. After the exciting FFA activities of the day, I was on my way back towards home to meet my wife and daughter at a friend’s house for bible study. Almost, home I decide to get a little caffeine and stopped off for a coffee. I place my order at the drive through and pulled around. To my surprise, in the window is a former student and FFA member. What a nice way to end my FFA day before getting home. She informs me she has just finished her AA Degree, is attending State College to get a degree in Psychology and is engaged to be married next year to another former student and FFA member. Now, this is a personal post about a great day I had. I have told myself that I wanted to keep my blog very professional and stay away from personal information. But I think this is directly related to my profession. These are the things that make being a teacher of agriculture and an FFA Advisor great. Days like today remind me of why I enjoy working with these young adults. Some days they can be a little unruly, but when it is all said and done, I work around a great bunch of students and look forward to watching them achieve and have success.